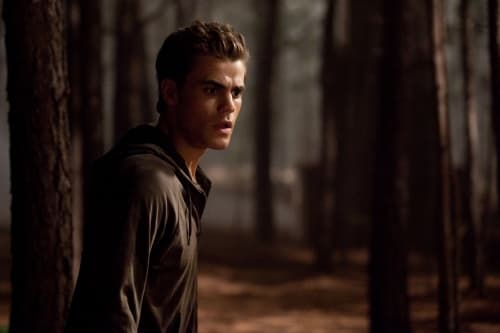 The Vampire Diaries Review: Bewere of Wolves! This week's episode of The Vampire Diaries gave us the possible end of one relationship (Elena/Damon) and the mysterious beginning of another (Katherine/Caroline). The world of werewolves was created 600 years ago by the Aztecs. Their natural enemy? Vampires. Their bite? Deadly to these blood suckers. What this portends for Damon, Stefan and company? Nothing good. What makes these creatures especially worrisome is that they can't seem to control their urges. As Stefan has proven, and as he tried to teach Caroline throughout the hour, a vampire can fight back against his most carnal desires. But Mason seems to be a good looking guy with his shirt off, as he tried to chain himself in because he knew a full moon was on the way. Alas, the effort failed. If even the best-intentioned werewolf can come oh-so-close to taking a chunk out of a vampire's neck, just imagine what an angry werewolf would do. No wonder Stefan's face in the photo above is a whole lot more scared than his "hey, it's Tuesday" face, huh? ... Damon tried to kill Jeremy, and Elena sort of guilt-tripped Damon into giving her a book on Katherine's life. Sorry, D, but those two aren't exactly even. Give Elena a break, and also remember what Katherine said on the premiere: hating someone can be the start of a relationship, not the end. I have a feeling Delena fans can continue to hold out hope for a reconciliation. All it takes to move on from your ex-wife and finally make out with the sweet woman who crushes on you is for the former to become a vampire, for you to take a road trip to her alma mater and for her pretty graduate student to make you realize how nutty you must be to remain stuck on such a self-centered, supernatural being. Good to know. Best of luck, Alaric and Jenna (Jalaric? Jeric?)! Stefan was wrong about Caroline. He said her personality would be heightened, and we saw flashes of magnified insecurity and humorous whining... but, in the end, Caroline actually proved quite selfless, forcing Matt to dump her, for his own safety. Stefan even admitted this was a step he couldn't bring himself to take with Elena, even though he knew he should. Overall, "Bad Moon Rising" was an action-packed episode that shed light on the Lockwoods and werewolves in general. I'd have been content with it even before Katherine showed up and told Caroline they were gonna have "so much fun together." Sound off now, readers, and take your best guesses: What the heck does this eerie tease mean?!? If werewolves exist, where the hell are they? Permalink: If werewolves exist, where the hell are they? Alaric: You did kill her brother. Damon: There is a huge asterisk next to that statement: he came back to life. Permalink: You did kill her brother. he came back to life. The Vampire Diaries Round Table: "Bad Moon Rising"